We are renowned as a leading name engaged in manufacturing with ISO certified, exporting and supplying an excellent range of Hang Tags (Strung). Our qualitative hang tags (Strung) are manufactured using quality tested raw material and sophisticated technology in sync with industry norms. Furthermore, our quality examiners test these hang tags (Strung) on different parameters. 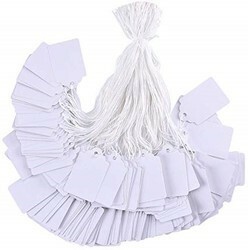 Illustrious for their fine finish, and attractive design, these hang tags (Strung) are widely used in garment industry. 7. MANILLA TAGS STRUNG 48x96mm 1 box includes 100nos for 2000rs. We are renowned as a leading name engaged in manufacturing with ISO certified, exporting and supplying an excellent range of Hang Tags (Unstrung). Our qualitative hang tags (Unstrung) are manufactured using quality tested raw material and sophisticated technology in sync with industry norms. Furthermore, our quality examiners test these hang tags (Unstrung) on different parameters. Illustrious for their fine finish, and attractive design, these hang tags (Unstrung) are widely used in garment industry. DESIGN Special design allows you to use you own tag gun or special twine, wire or ribbon you like and you can get enough space for decoration or writing your name and message.